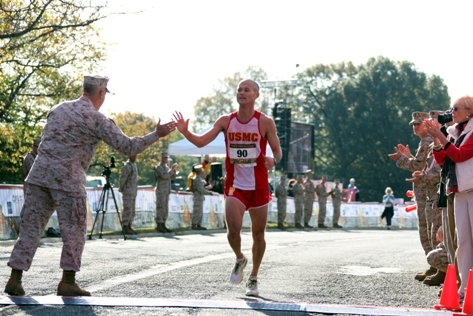 U.S. Marine 1st Lt. Sean Barrett crosses the finish line of the 35th annual Marine Corps Marathon and claps hands with Gen. James F. Amos, commandant of the Marine Corps, Oct. 31. Barrett, 25, finished the race in 2:24:08 and was the first Marine runner to cross the finish line. The Wilmington, N.C., native is Harvard graduate.